Back On Track for Lent with a Custom Lenten Prayer Journal! It just occurred to me that I might not be the only one who needs a little restart this Lent! With March Break this week, some of our Lenten resolutions have fallen to the wayside. I have however, been prayer journaling again and I think some of our new tools in the Arma Dei Shoppe have been helping! 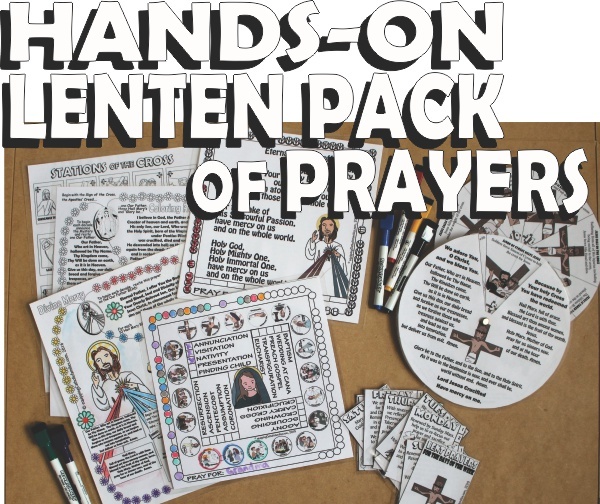 Equipping Catholic Families with a NEW Hands-On Prayer-packed Craft Kit for LENT! So, even though I have 50 Cathletics Craft Kits in my Arma Dei Shoppe, it’s hard to believe that I don’t actually have one craft kit dedicated to LENT! Well, that is, until NOW! 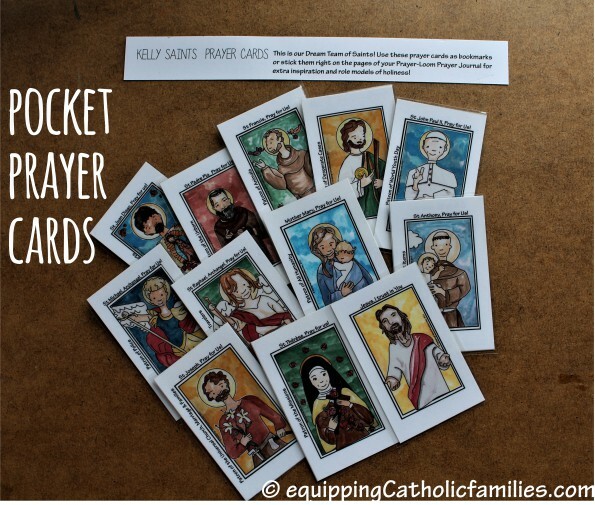 This craft kit focuses mainly on the Stations of the Cross, the Rosary and the Divine Mercy Chaplet and offers more inventive ways to get kids hands-on praying! Prayers are counted as beads are colored or laced up with a shoelace! Our Super Saints illustrations are kid-friendly and enticing and help to focus our prayers just a little bit more! Plus, they’re just fun to look at! Catholic Stamps for planners, prayerbooks and penpals! 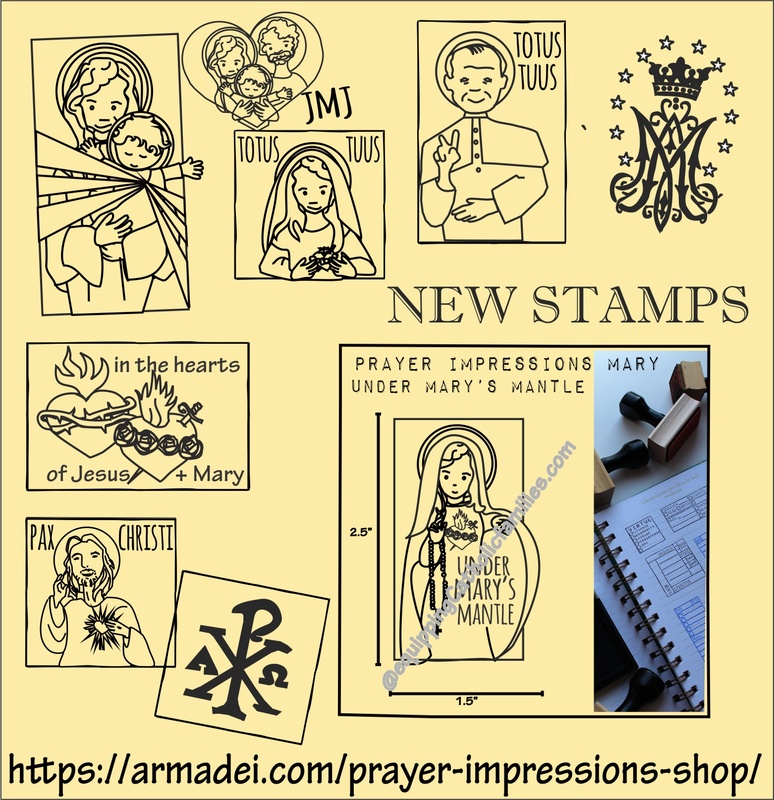 I’ve just added 17 new stamps to our Prayer Impressions Journal Stamp Shoppe at Arma Dei! This after adding a bunch of Rosary stamps, just a few weeks ago! These stamps are perfect for your prayer journal, Christmas Cards, lunch notes, penpal correspondence, planners, calendars, adult coloring, Bible journaling…and more! Prayer Transcripts: A New Kind of Prayer Journal! A Little Way to Pray Companion Workbook is a 12 page workbook kit to help you find your own custom prayer prompts to pray every day. The PDF includes practical tips for Prayer Prompts, pick and choose templates to establish your own custom Prayer Prompts that fit your life, Prayer Starters, printable Prompts to Pray banner and Pocket Prayer Prompts. Does praying “Jesus, I trust in You” seem empty and ineffective? 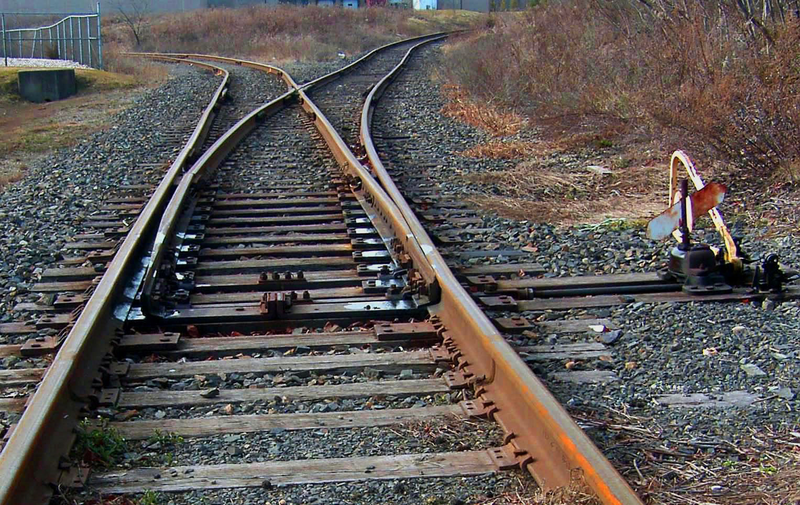 The Track Changer can help us pray more deliberately, consistently and effectively! 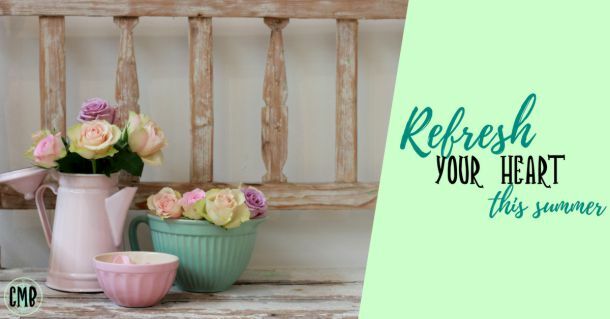 Recently, when I was facing a little extra stress and anxiety, I learned something integral to effective prayer! While I’ve been taught that the effectiveness of our prayer does not rely on or become apparent through our feelings, there is something we can do to make our prayer more deliberate and consoling. I’m going to call it the track changer. 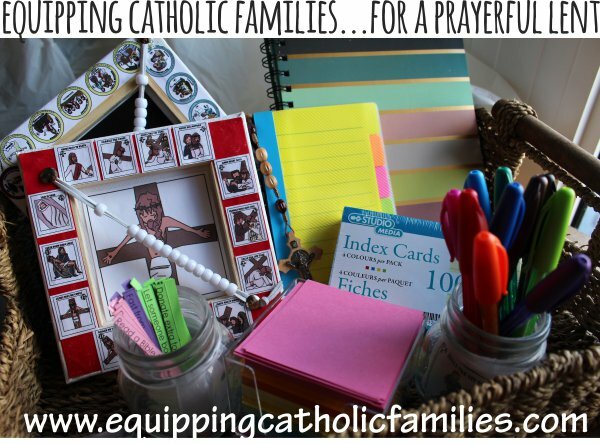 If you purchased the Catholic Mom Bundle last November, you received this Prayer Journal Prompts Special Bundle. It’s a carefully crafted collection of prayer prompts, classic prayers, 9-in1-Novena prayers and Saint Stamp image templates…ready for printing to customize any dollarstore notebook into a unique and powerful personal Prayer Journal! renovated and re-released this week at Equipping Catholic Families. 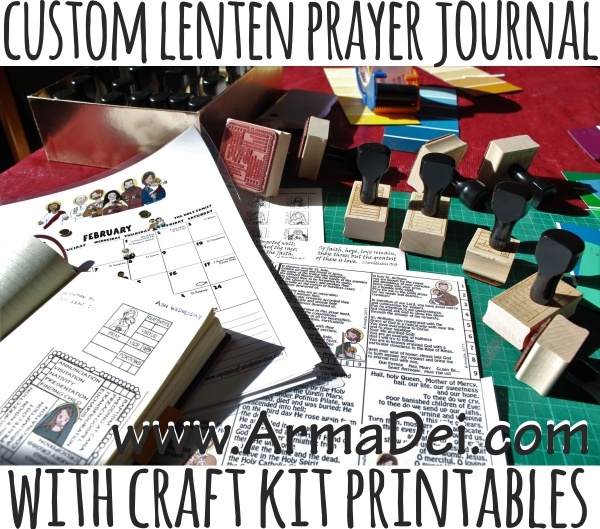 We’ve expanded the Prayer-Loom Prayer Book Craft Kit! The Prayer-Loom Prayer Book Craft Kit features 7 pages of prayers and illustrated prayercards, a Faith mentor template to record insights and prayers from loved ones, along with helpful tips and links to make this Heirloom Prayer-Loom Prayer Book a keepsake Sacrament gift and prayer journal.